The Violet Richardson Award recognizes and honors young women between the ages of 14 and 17 who make the world a better place through their volunteer efforts. Violet Richardson was Soroptimist International’s first club president from Oakland, California in 1921. A woman of action, whose indomitable spirit and sense of personal responsibility were demonstrated by her lifelong commitment to volunteering in her community: community is important. 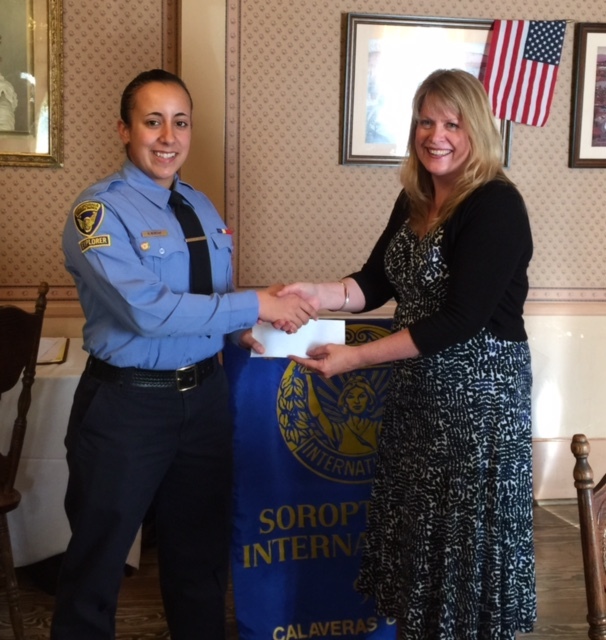 Soroptimist International of Calaveras County, continue our commitment to recognize a community-oriented young woman and award $500 to Emily Smith, our 2017/2018 recipient, for her outstanding volunteer service. 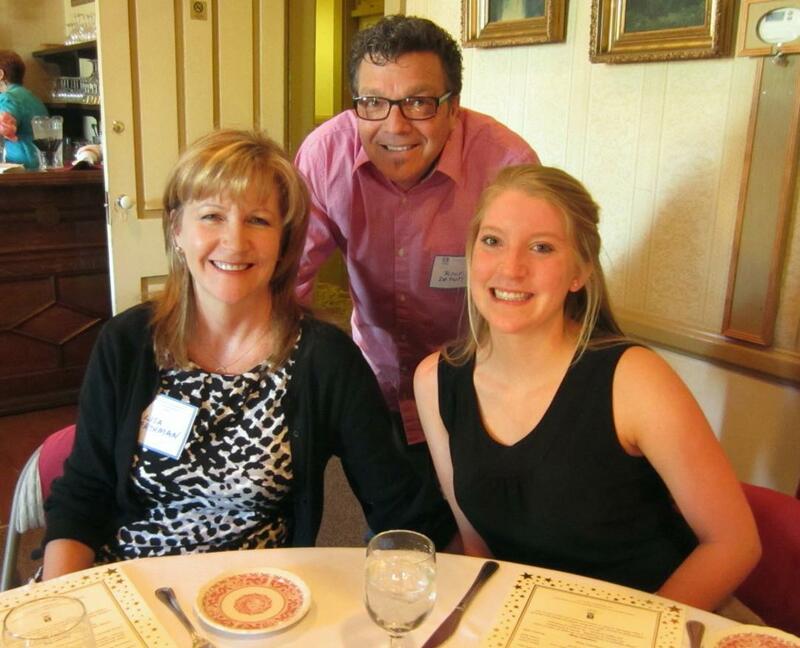 Emily is an active Senior at Calaveras High School and is committed to addressing the issues of substance abuse and mental illness in her community by her volunteerism. Emily is involved with Friday Night Live as a mentor to students in Middle School; with the Calaveras Youth Council as its President; with ROP Medical Science program as a student; and with the Mental Health Board of Calaveras County as a member of the community. Emily chooses to see challenges instead of obstacles and hope instead of despair in her work. 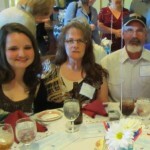 She plans to pursue a career in the field of medicine and SI Calaveras County endorse her endeavors through this award. Congratulations, Emily! Emily Smith – Violet Richardson Award Winner for 2017/18 and presenter, Patsy Gonzalez, incoming President. The Violet Richardson Award recognizes young women who perform outstanding volunteer service in our community. Instead of obstacles, these young women see challenges. Instead of despair, they shine with hope. This year Natasha Koval was selected as the 2017 SICC Violet Richardson Award winner and presented a check for $400 at the recent Awards Dinner. Natasha is currently a senior at Calaveras High School and has already demonstrated dedicated service to make the world a better place. 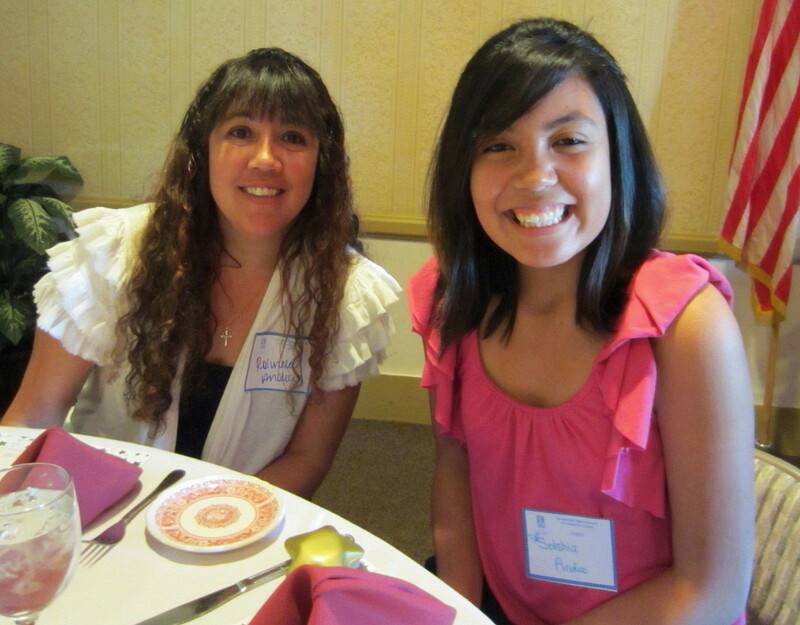 Our Club recognized Natasha for her volunteer service and outreach to a dangerous neighborhood in Stockton. Natasha, along with her family, provide food, a caring and open heart and a witness to their faith to the residents of the neighborhood who congregate in the Sandman Park on a weekly basis. Natasha shared that the true reward for her service is the knowledge that her volunteer service has had a powerful and positive impact on the lives of those she serves. We are confident that Natasha will continue to embody the spirit of the Violet Richardson award as she pursues a business degree at Pacific Lutheran College. 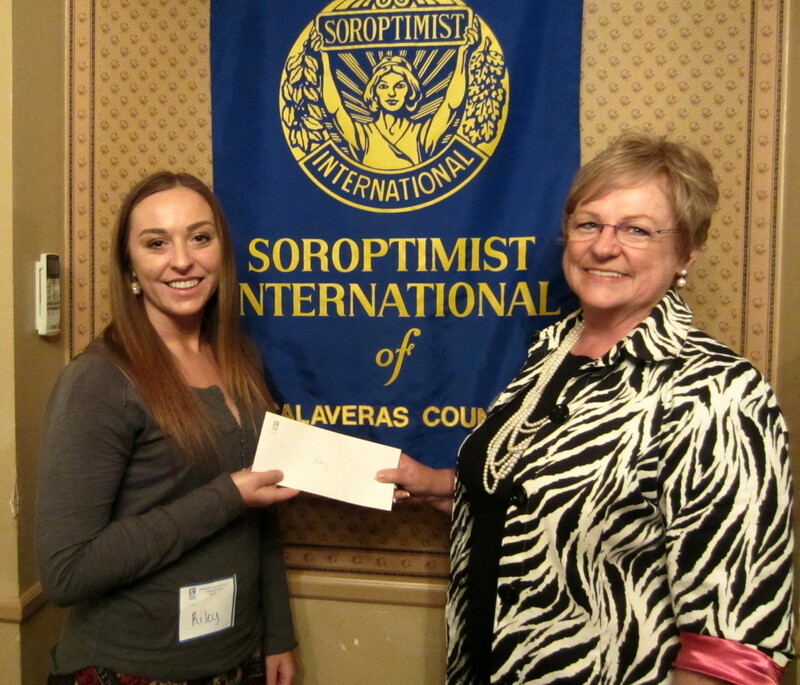 Rebecca Worthy was chosen as the Soroptimist International of Calaveras County Violet Richardson award winner and presented with a check for $400 at the annual Awards Dinner at the Murphys Hotel. 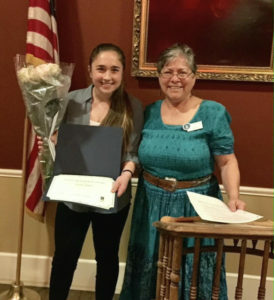 Rebecca epitomizes the ideals of the Violet Richardson award for volunteer action through her involvement with the California Highway Patrol Explorer program and her related service as part of the Calaveras High School student patrol class. As a CHP Explorer, Rebecca is pursuing her goal of a profession in law enforcement while at the same time giving her the opportunity to give back to her community by volunteering during the Butte Fire, fundraising for a leukemia patient and assisting patrol officers. As a member of the student patrol class, Rebecca provides traffic control at a local elementary school and provides additional volunteer community work. Rebecca’s discipline, commitment to service and obvious passion for helping others is commendable. 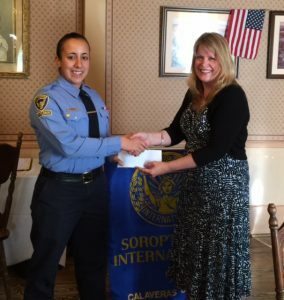 The members of the Soroptimist International of Calaveras County are happy to recognize Rebecca Worthy’s many contributions and accomplishments and know that this young woman will continue to outstanding citizen with a very bright future. SICC is proud to announce two (2) Violet Richardson Award winners for 2015. Shasta Garcia is being recognized for her volunteer work with the Public Access Community TV in San Andreas. While a student at Mountain Oaks Charter School, Shasta created a local talk show which focuses on issues of pertinence to teens. Due to Shasta’s experiences as a victim of bullying, she is committed to inspiring and helping teenagers overcome obstacles. Her volunteerism has expanded to work at the Calaveras Enterprise and mission outreach in Mexico. Shasta was awarded $300 and plans to pursue college degrees in communication, psychology and public relations while continuing her work and having a positive impact on others. 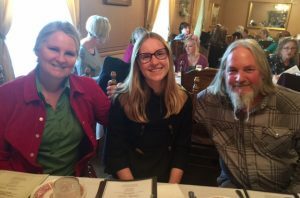 SICC’s 2nd Violet Richardson Award winner for 2015 is Riley Shoemaker who is being recognized for her work with the Circle of Friends group at Calaveras High School. The Circle of Friends Club promotes inclusion and social interactions for students with special needs, developmental disabilities and social challenges. Students with strong leadership and social skills like Riley are paired with students who would benefit from support and friendship. Riley’s own experience of watching her older sister be mistreated due to being perceived as “different” gave her the courage to stand up for others. She currently serves as the President of the Circle of Friends. Riley was awarded $200. 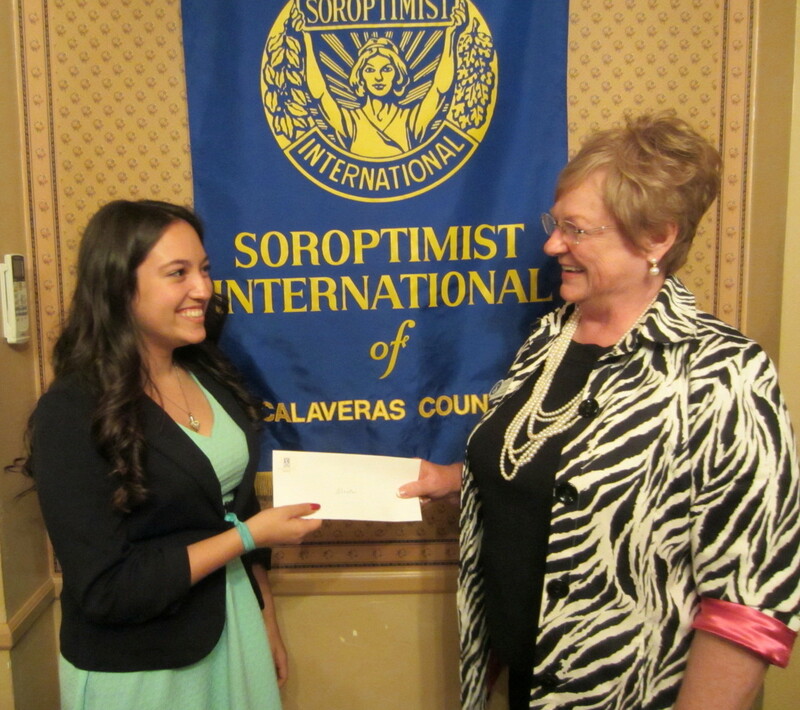 Machaela Wisdom was chosen as the Calaveras Soroptimist Violet Richarson 2014 award winner. 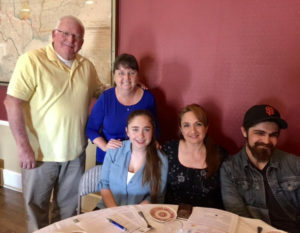 Her dedicated volunteerism for “Friday Night Live” at Calaveras High School was a factor considered by the selection committee. 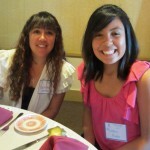 Machaela has served as a mentor to students entering high school and helped students form a positive group of friends. In addition, Machaela is active in her church and has served as a tutor. 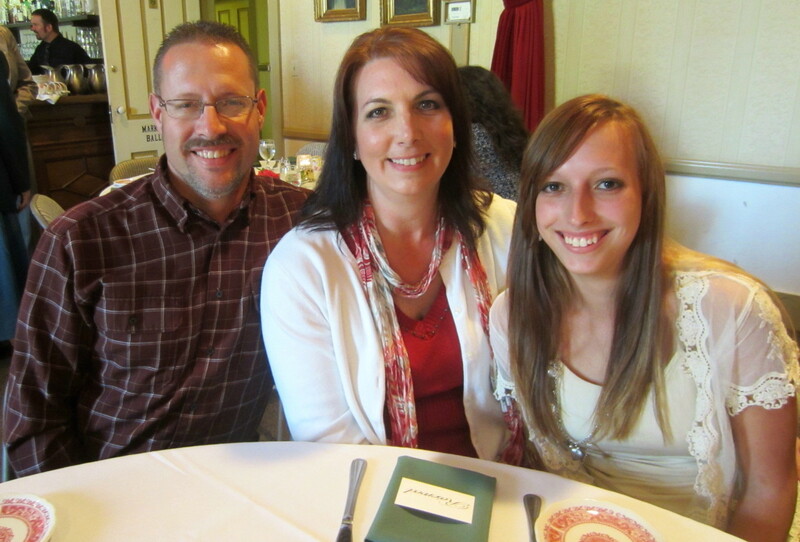 Machaela will be attending college in the fall of 2014 with the professional goal of becoming a social worker. Machaela received a $500 check in recognition of her many volunteer activities. 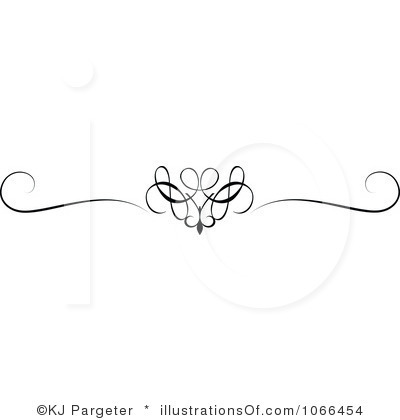 Committee Members this year were: Julia Tidball and Kathy Northington. 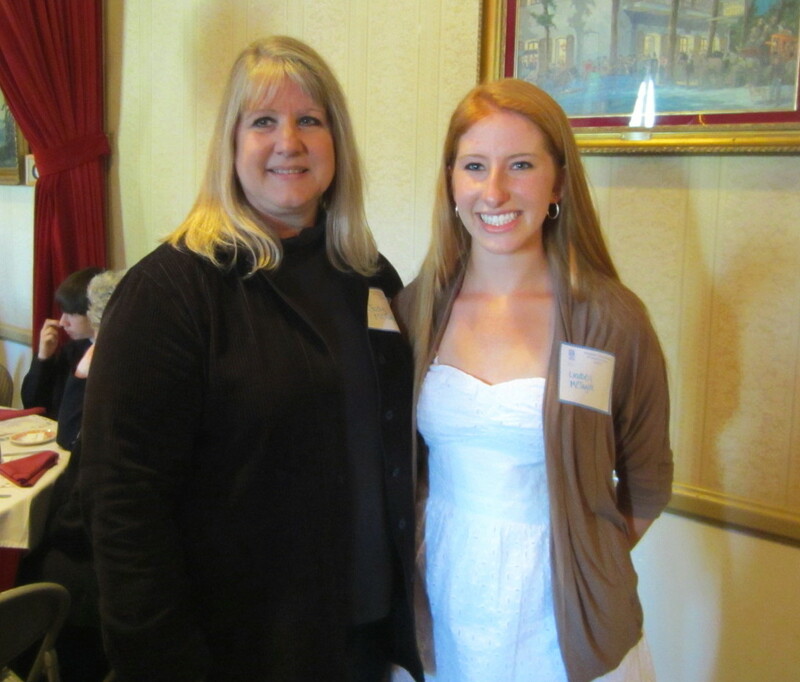 Hannah is a junior at Bret Harte High School and President of “Interact”. She is an amazing community volunteer as shown by the many areas she has been involved with. A few examples are: Rotary’s Crab & Shrimp feed; serving food, this past November, at the Teddy Bear Tea sponsored by Soroptimist International of Calaveras County; decorating Mark Twain Elementary School for Red Ribbon Week; organing a coat drive at Bret Harte that collected more than 150 coats; purchased $350 worth of toys at Wal-Mart which were donated to a local toy drive and led the Interact club as they raised money for the local Food Bank. 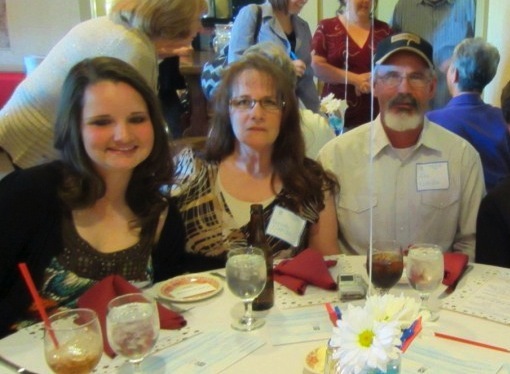 Hannah told us, at the Awards Banquet held on April 18, 2013 at the historic Murphys Hotel, that “volunteering has become my passion and I have learned that there is much more to life than just worrying about yourself.” She suggested that donating time and effort to improve the lives of others would make the world a much more pleasant and peaceful place. In her parting remarks she shared that wherever her life takes her, volunteering will always be a big part of it. 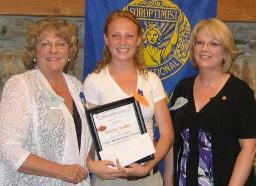 Hannah received $500 in recognition of her community volunteer efforts. Applications for the Violet Richardson Award in 2012 presented quite a dilemma for the committee. 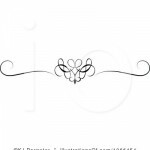 Four outstanding young women applied who fit the criteria for the award to a tee! 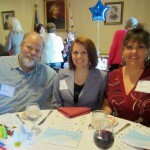 Unheard of in recent history for SI of Calaveras County, all 4 were given awards! 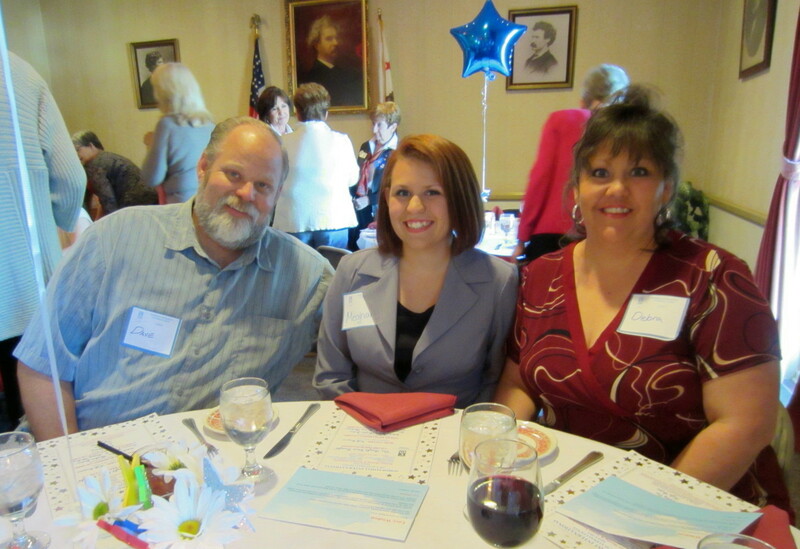 Below are photos of these outstanding Calaveras County women shown with their families or accepting their awards. We are so proud of each and every one of them & know that they will go far in life. 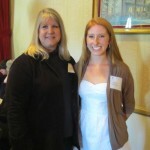 Kaylee Sedler was honored as 2010’s recipient for her exemplary community service. She has been involved as a leader and as an avid participant in Interact, Impact, The Team for Change, Peer Counseling, Friday Night Live Mentoring, Kindness Crusade, Link Crew, Renaissance, Special Olympics and I WILL. She was awarded $250 at the club level and went on to win the Region’s award of $500. 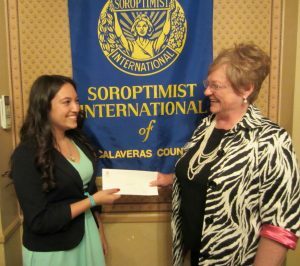 Kaylee’s motto is taken from Ghandi’s famous words: “Be the change you want to see in the world.” Congratulations to Kaylee and a future Soroptimist.